In this blog post, we are featuring the best iOS walkthrough app designs of 2018, which you can use for your own inspiration. We’ve selected a list of gorgeous UI app templates that are meant to inspire the readers. All of them contain modern mobile user interfaces, that are clean and elegant. The criteria we’ve used in order to curate this list of onboarding flow designs were based on a variety of properties, such as UI, UX as well as the expected conversion rate, from a growth perspective. The last one is extremely relevant because it’s the property that measures the effectiveness of the walkthrough flow. 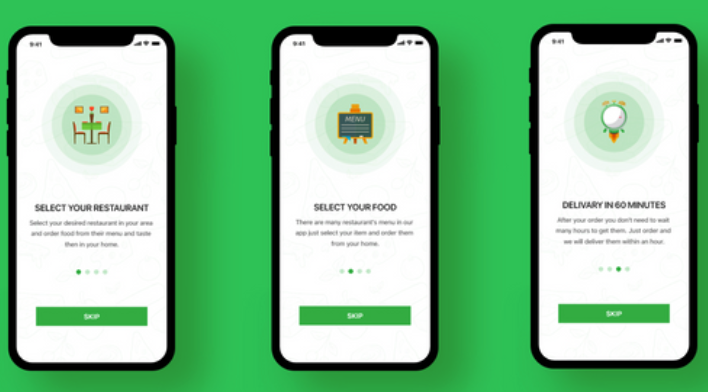 The role of the walkthrough onboarding flow is to educate the new users, convince them to create an account and eventually retain them long term into your app. We’ve selected this template due to its elegance. Modern mobile walkthroughs should be as clean as possible, to not distract users from their main purpose: conversion. While optimized for call to action, the design lays out clearly the value proposition of the app. 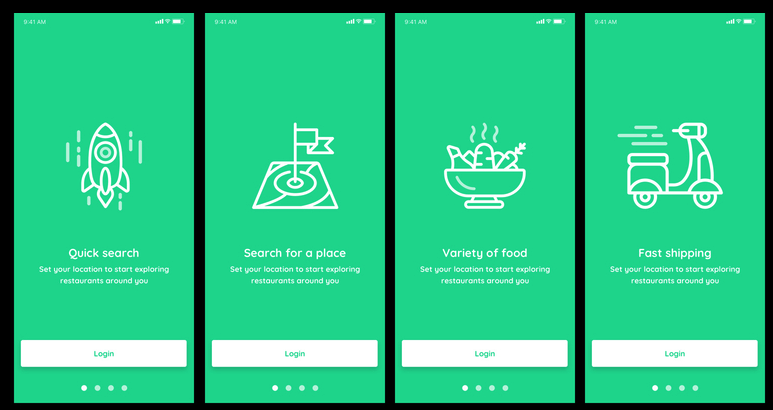 It welcomes the customers to the newly installed app while at the same time it educates them on what the app is about and why they should sign up. All this in a very subtle manner, providing them optionality (notice the “Skip” button at the top). Genius! If you’re making an iOS app that’s targeting more professional users, such as business owners, entrepreneurs or developers, you’d like a walkthrough app design flow that expresses more seriosity and professionalism. This walkthrough flow is perfect for that. Simple, effective and pro. 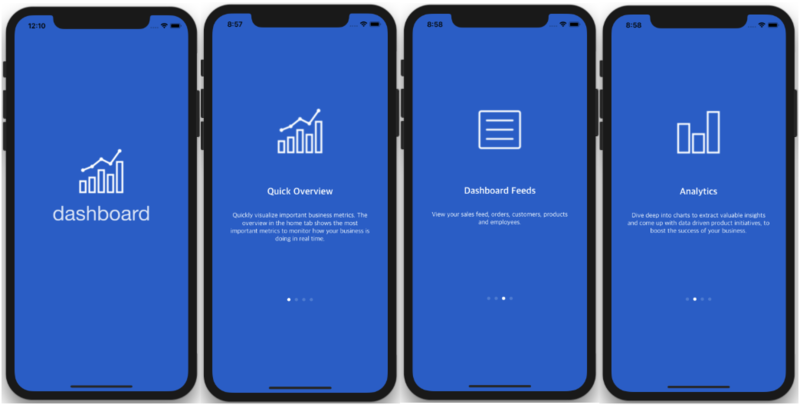 We’ve already integrated it into our fully-implemented Dashboard iOS app template, that’s helping business owners stay up to date with their business metrics. Oh, the implementation of this walkthrough can be also downloaded FOR FREE on our app templates page. You’re welcome! Next time you’re looking for an amazing walkthrough onboarding design, that’s also easy to implement, get your inspiration from this excellent piece of art. It has a clear value proposition and it conveys it elegantly. It uses a well-known iOS UX pattern (the iOS pagination elements) and extremely simple image assets. Having only one dominant color saves you a lot of headaches with matching texts, backgrounds, and icons. Plus, you can adapt it to any app trivially. Oh, and you can simply use a UIPaginationViewController and the implementation is done. Convenient, right? Still looking for your perfect walkthrough design? What about this one? While extremely similar to the previous onboarding design, it reverses the color scheme to white out the background. This is much more suitable for mobile apps that have a lighter app theme. What we absolutely love about this app onboarding template is the brilliant iconography work. Observe how regular icons are being blended into the app’s color scheme through the concentric circles whose colors are fading away gradually. Incredible! Aaand it’s a wrap. These are, in our opinion, the best iOS walkthrough app designs of 2018, so far. Any other walkthrough designs you came across and you’d like to share? We’re always seeking inspiration so please share them with us!